Who do you think would have done a better job with Anniversary? Core-made trailer of Anniversary is? I think everyone will have the same opinion then about who would have been better. and if anyone knows how to make a poll, please enlighten me. I seem to have forgotten, and i wanted this to be a poll. I think polls have been disabled since because they were becoming a tad pointless. I don't think that you can post a link to the canned version simply because it's meant to be forgotten and regarding who'd do a better job, well, Crystal stands tall. You post a link to Cores version and you will most likely be banned, so please do not. so i definately posted the video link via youtube then deleted it because i thought it was too risky. Then I saw you post and was like, "Whew, glad I deleted it!" thank goodness Core didn't make it is all I have to say to those who still are unsure if CD should have made it. Without Core Design and there wouldn't have been Tomb Raider at all, and without Crystal Dynamics there wouldn't have been a new lease of life for Tomb Raider. So overall, they both stand equal. The banned video? why even bring it up anynmore? you make a really good point, but I think TRA will determine who is better with Lara. I personally think CD will be winning after the release. I think TRA will determine who is better with Lara. I personally think CD will be winning after the release. How do you figure? I don't think taking someone else's game and "re-imagining" is any litmus test for the creative skills of anyone. Sheesh, I could "re-imagine" TR1 and have it be fun. So could any other TR fan probably. I don't consider Legend a very good Tomb Raider game. I could count on one hand the moments I felt like I was playing Tomb Raider and not any other recent 3rd person action/adventure. I'm not saying it wasn't a well-executed game, but the things that (IMO) made Tomb Raider Tomb Raider were mostly absent. My hope is that CD, by taking a long hard look at what captured the imaginations of gamers, will understand what the game of Tomb Raider was all about, and henceforth create games accordingly. As far as the trailer, I guess what I thought was interesting were how many "Legend" moves were in the trailer done by Core. Of course, POP had been released by that point, so anyone could imitate it, but I'm reading comments that CD brought all this wonderful stuff to the table, and I just don't see it. The heroine and set up were created by other people, the move-set was created by other people, the button-sequences were invented by other people. Measure, mix, and bake---voila! New game? Or is everyone's memory so scarred by AOD that a fully complete and glitch-free game makes Legend more wonderful than it actually is? I'm not trying to take away anything that CD did do, which was deliver a commercially successfully game that guaranteed us more games. But had Legend been the first "Tomb Raider" game released, I wouldn't be as in love with the series as I am. as much as i love the core games i think crystal dynamics saved their arses to be fair, until legend tomb raider was a dying star, nothing ground breaking or new or should i say new in a good way was being done, they were playing it save, churning out the same old, as much as i love dthe same old its clear the gaming industry doesnt work like that. crystal brought the beauty and fresh image that core just couldnt, i think this was because core were too emotinaly attached to the game, crsytal came in and just looked and listened to what the fans wanted and made the game without trying too much to keep the old stuff, it may have been risky but it worked. although the core version looks interesting and i would buy it, its clear to see the crystal version quality of graphic wise takes it to the next level, cores version looks very 4 years ago, crystals looks like its using the cutting edge of every aspect of the technology that is available through the ps2. i do feel sorry for core, it was their baby, but if they cant keep up then its just not right to not give the fans the best when crystal can offer that. I'd have / will enjoy both Core's and Crystals. I liked the way Core make the games, and Crystals are enjoyable, they just need to do things a bit better. On the subject of TR:A, I think I would've disliked less things about Core's TrAE than I'll probably dislike about Crystals TR:A, but saying that there's still lots of things I'm really looking forward to with Crystal's. I believe it's going to be a great help for them when making future games. IMO this is a totally unfair comparison. Core Design started the franchise with advanced polygraphics tools at the time. They had progress over the years bringing finer details and more fluid environments into the world of Lara Croft. Crystal Dynamics came into play years later with Legend build upon the Quake game engine. As a result the graphics and controls were stunningly beautiful and easy to understand. Both game developers has their own faults and strengths. By comparing them is like trying to compare apples to grapefruits. Aside from the fact they are both fruits there is no other similarities we can use. Click here to view the world through my eyes. To me, they didn't do a whole lot as far as advancement. Granted, Anniversary came a long time after the first five, so I'd expect it to be better. These are renders, I didn't have the time to get in-game and cut out from the background and all that other stuff. I think the from TR2-TR5, there was little Core did to improve the graphics. I played Spyro from before those games and it had better graphics. 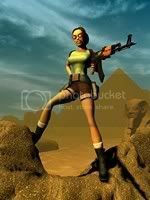 TR1 was pretty bad as far as graphics, but that was mainly technology, they couldn't even give her a ponytail. And I feel that when Core tried to improve their graphics, (i.e. Angel of Darkness) they crashed and burned (so maybe that's a little too harsh, oh well) for gameplay. The story line was good, it just was one of those games where it was OK. Crystal Dynamics came into play years later with Legend build upon the Quake game engine. I hear that Legend is based on the 'Legacy of Kain' engine, and Anniversary is based on, and is an advanced Legend engine. So these are the building blocks. The Quake engine, bloody excellent in it's time btw, is excellent for first person perspective games. I'm reading comments that CD brought all this wonderful stuff to the table, and I just don't see it. The heroine and set up were created by other people, the move-set was created by other people, the button-sequences were invented by other people. Measure, mix, and bake---voila! New game? comparing core design with crystal dynamics isn't a well-formed issue, in my opinion. core design made a unique contribution to video-gaming- tomb raider. (i.e. more than just classic tomb raider in new clothes). under crystal dynamics, tomb raider is born anew, increasing in popularity as time goes on. allowing them to ingest what made tomb raiding great. that people can fall in love with (for the first time, all over again). with all due respect, remove your chains from Legend (et al.). hold onto your memories, instead. and also leave a (growing) space in your heart for a new prodigy. To me, they didn't do a whole lot as far as advancement. Granted, Anniversary came a long time after the first five, so I'd expect it to be better... And I feel that when Core tried to improve their graphics, (i.e. Angel of Darkness) they crashed and burned (so maybe that's a little too harsh, oh well) for gameplay. The story line was good, it just was one of those games where it was OK.
all crystal have really done, is given lara a new look. think of it as the show the swan and put it into concept. a mother (core design) giving birth to something beautiful, but to some she wasnt enough, her father (eidos) couldnt give a dang, and sent her off to a surgeon (crystal dynamics), her father refused to take her back to her mother, and ran off with the sergeon... you know... that old chest-nut. shmeh..... lol, i love to go on about total crap. its my think you know..
IMO Core is way better, i like CD`s work and i will buy the games they release. But noone made a better lara then the creators themself, and Anniversary looks very good, but that grappeling thing... lara dosent need that, she dosent need Z & A Either. In the old games it was simple: 'im a tough girl, dont you dare to blend into my buisness' while CD`s lara is more 'im silly, dangerous but careful''. But CD does a good job, they really do. I hope anniversary will give me the TR feeling again, though i doubt it. i think its dead. So im a core fan, and i hope to see their tomb raider products again. 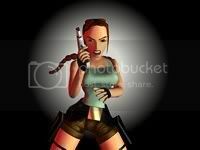 For me the winner is CD because they made Lara beautyfull and now she looks like human not like pinocio. IMO great graphics dosent make a great game. All I want is to play Tomb Raider. And Legend was not Tomb Raider. Sorry, but it wasn't. Tomb Raider at is core (no pun intended) had nothing to do with Lara or with tombs---it had to do with exploration and the "what do I do now?" feeling. That feeling of isolation and dread, the thrill of actually finding something. Without that, then it's just like anything other good 3rd person action adventure game like PoP or GoW--run me through some platforming, battle droves of enemies, throw in the occasional puzzle to break up the action and wow me with cut scenes. I agree that Eidos has a share of the blame for the downfall of Core, but when I look at AOD I think Core was going down too many dead ends that were never going to work--the role playing aspect being one of them. It's tough to say whether more time would have made AOD a good game. As I said before, I hope that by really looking over the original they will understand what made Tomb Raider games different from other action/adventure games. I think Core's version looked great and i have to agree about Legend, its a good game featuring Lara Croft but not a pure TR game. The old gameplay, music, design etc are still apretiated by many fans. What happened to Core could happen to Crystal too, the early TR games were all very alike because back then they were pushing one game wright after the other but they were still good and lenghty. TR:A doesnt look much diferent from TR:L, they just removed some overdone gameplay elements and added the prince of persia wall run. Some people are even happy that TR:A looks more "classic" and would like it stay that way. Yes but CD made great game with great graphic. to be honest, no matter what or even who makes the game, tomb raider is tomb raider and theres no arguing with that. lol Who cares about graphics, cuz when the first TR came, man all I cared about was the action and scariness she provided WHENEVER AND WHEREEVER! I mean like i was suspensful of every corner, and really it literally was every corner...unfortunately I check every corner I go around now :S... sadly. anyways! uh... lets jus make peace and say that Lara...even as a computer generated...."person"... is still beautiful and you know still is alive...somehow.... unrealisticly :S.. But hey it's a game, that people are obsesed over, and I wouldnt blame them. just know that people will always find something wrong with every game, so come on and just wait and see before you judge what its going to be like. You wouldn't like it if you were a Core or Crystal designer and were reading this u wouldnt be impressed. So do 2 others as you would like to be done to yourselves. How many % of your CD's are games?